Chafik SABIRY is an entrepreneur and investor in projects with Scale Up potential, with a particular interest in Morocco’s digital economy and global businesses. Chafik SABIRY is a volunteer in the promotion of entrepreneurship in Morocco since 2011 through an effective presence in the following networks: StartUp Morocco, Réseau Entreprendre Maroc – Member of the Board of Directors, CEED, Endeavor – Member of the Local Selection Panel. As part of the promotion of entrepreneurship through training, Chafik is part of the team that launched the Fouder Institute – Silicon Valley in Morocco in 2016. Still on a voluntary basis, he receives many young startups and helps them at different stages of maturity, including as virtual CEO. Chafik is a corporate director and sits on boards of directors managing scale up and international expansion projects. Previously, Chafik SABIRY was at the origin of the creation of HP CDG IT Services Morocco in 2006, then headed it as Chairman of the Management Board from 2008 to 2015, bringing it from a new project to over 1300 employees at the time of his departure. 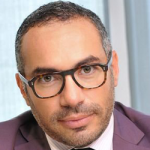 Chafik SABIRY has held senior positions at EDS France and AT Kearney in Paris. Mr. Sabiry is a graduate of ESCP Europe.